Wednesday, April 04, 2018 by: Isabelle Z. (Natural News) Are you doing everything you can to avoid diabetes or control it if you already have it? It’s a frightening illness that can severely impact a person’s quality of life and even lead to death, so it’s only natural that people who are concerned about their health take steps to reduce their risk. Perhaps you’re already avoiding sugar, watching your diet, and getting plenty of exercise, but are you eating enough ginger? A new study has demonstrated just how powerful ginger’s effects are in fighting this all-too-common disease. Seventy patients with type 2 diabetes participated in a double-blinded, placebo-controlled trial to assess how ginger could affect their glycemic status, inflammatory markers of the condition, and their lipid profile. A control group took a 1600mg placebo, while the ginger group took 1600mg of ginger daily. Measurements were taken at the beginning and end of the study to assess their blood lipids, blood sugar levels, tumor necrosis factor alpha, prostaglandin E2, and C-reactive protein. The researchers found that those who underwent the ginger treatment had significantly lower levels of quite a few parameters. These include the important fasting plasma glucose, insulin, triglycerides, total cholesterol, and inflammation markers C-reactive protein and Prostaglandin E2. They also had lower levels of glycated hemoglobin, or HbA1C, which measures how much sugar is damaging the body’s red blood cells, and a measurement of insulin resistance known as HOMA. The amount of ginger the patients took equated to 1.6 grams, which is not a very big amount; it’s roughly equivalent to just ¼ of a teaspoon. They took it in capsule form in doses of 800mg twice per day. Ginger comes from the same family of plants as turmeric, which was shown in a recent study published in the journal Diabetes Care to be 100 percent effective in preventing people with prediabetes from developing full-fledged diabetes. In the placebo-controlled, double-blinded and randomized study, researchers in Thailand divided 240 prediabetic participants into groups, one of which was given 250 mg of curcuminoid daily, while the other served as a control. A variety of parameters were measured at the beginning of the study and every three months up until nine months, and the researchers reported that while 16.4 percent of those in the placebo group went on to develop type 2 diabetes, nobody in the curcumin group developed the illness. That’s a remarkable accomplishment, and it is excellent news for the two out of five Americans aged 40 to 74 who are estimated to have prediabetes. After all, curcumin is found in turmeric, which is not only easy to find and affordable, but also very safe. It’s easy to incorporate more ginger and turmeric into your diet, and doing so can give you a fighting chance against diabetes in addition to many other health benefits. The two flavors complement one another well and can be used to create stews, curries, chicken dishes and aromatic rices for a one-two punch. The easiest way to consume more ginger and turmeric is by making a simple tea out of them; you can add flavors like cinnamon, lemon or honey if desired. You can also add them, individually or separately, to smoothies or soups. Ginger has a more noticeable presence, so it won’t work in just any soup, but it does pair nicely with carrots and other vegetables. Turmeric has a subtler flavor, which means you can add it to eggs, vegetables, smoothies and soups without worrying about affecting the flavor too much. Many people like to consume it with milk. Just remember to consume a small amount of black pepper with the turmeric to help your body absorb it. Turmeric and ginger capsules are also available, but it’s important to get organic varieties from trusted sources to ensure you are getting a pure product. 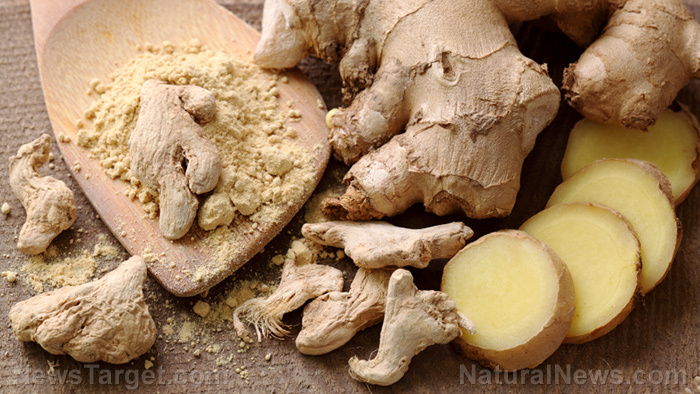 See Herbs.news for more coverage of medicinal herbs like ginger.